but I saved this photo for Midweek Blues! and a very expressive one at that! Link up your blues...a little or a lot. And don't forget to visit our blue friends! Oh, how fun! It's such a lovely place. 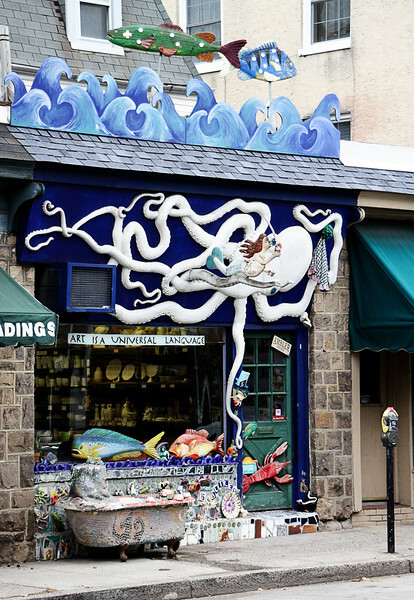 What a nifty little arsty place with a great octopus over the window; I wouldn't be able to resist visiting this one. Oh wow, if that's the outside I can't imagine what neat things you found inside. So spunky!! I bet there are all sorts of cool thing to photograph there! A cute little, creative place verging on elements of fantasy! One person's art is another's junk! I love those antique stores even if there is some art. This one looks especially good. I would come in. Wouldn't that mosaic bath look cool in our bathroom. very interesting shop Rebecca. I forgot to leave a comment yesterday when I added my link. duh...... must be mid week brain farts for me! !